I have decided to give my husband a “love note” for every day through February 14th. I still have to think of something grand for the big day besides the steak dinner he loves so much. I have health problems that prevent me from working so I was trying to think of something that my manly-man would appreciate and do it cheap. He doesn’t like all of the corny things people do on Valentine’s Day and really, I think he enjoys spoiling me more than anything. He is really special to me though and I want him to know it! I have decided that my love notes will come in several different forms and I have thought of the first two so far. Some of them will be serious and some will be funny. I really hope he likes my love notes. One thing I know he likes is to read. He especially likes to read about mid-evil times – so think castles and knights, dragons and even a hobbit or two. So I decided to make this love note look like a scroll. I’m sure he’s heard of the author too. This is part of a poem called Rabbi Ben Ezra by Robert Browning. I used heavyweight parchment cardstock in pink. Holding it landscape (long ways) I used the edge of my counter to tear off a strip. Then I moved over about 3 inches and tore off another strip. I’m going to use the 3 inch piece with torn edges on both sides. 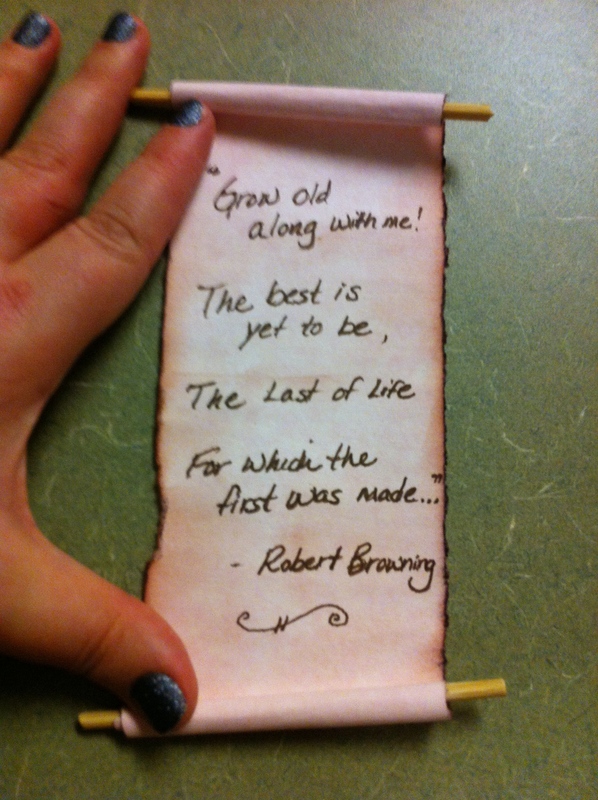 I used a brown marker to write out the poem. If you know how to do calligraphy that would look really nice. I just wrote mine in my regular handwriting. Then, I used a brown stamp pad on the edges to make it look older. I used my wire cutters to cut two pieces (approx 4 inches each) from a bamboo skewer (for grilling). You could use lollipop sticks too which you can easily find in the candy making section at craft stores but I’m just using what I had on hand. 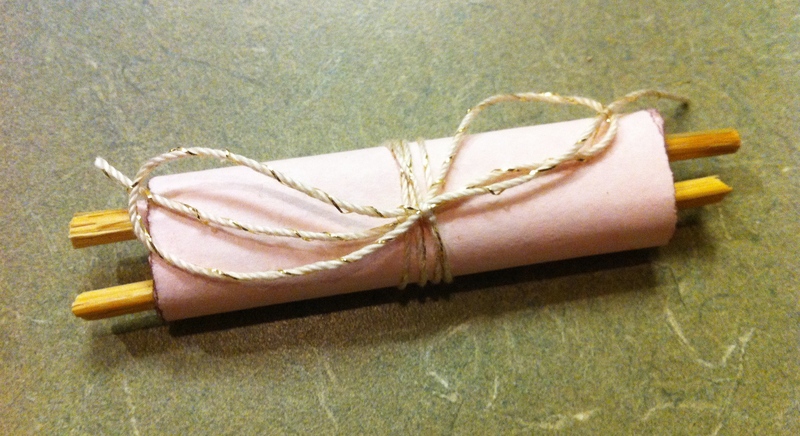 I glued the skewer pieces to the top and bottom of the paper and rolled it up like a scroll. I just used a hot glue gun since that dries faster. I think it looks really cute. Uh-hum, I mean handsome. I’m going to leave it in the car for him to find in the morning. I used some champagne colored crochet cotton (size 10) with a gold metallic thread wound in it to tie it together. I laid the scroll in the center of a length of thread and wound each side around two times each keeping it straight so it didn’t twist or overlap. I ended with each end in the back and then just tied it in a simple bow so it would untie easily. You know how impatient men can be! This is a FABULOUS idea, that I hope you don’t mind me using, as well! Good luck with your 14 days of love notes. Oh of course I don’t mind. That’s why I posted it :O) I did add one more thing though. It dawned on me that since it is pink my husband might assume it was just something of mine and not even look at it. So I made a small tag with his name on it and strung it on the string. So that way there is no confusion LOL Thanks for the comment! That is really nicely done!! I hope he is very pleasantly surprised. Thanks Rita. I had a lot of fun making this and it was so easy! Whenever you have a chance, email me at mom@webandofmothers.com and let me know your parameters (topic, length, subject) for Leap Blog Day. Thank you! What a fantastic idea! I’m so not creative, but truly admire people who are!